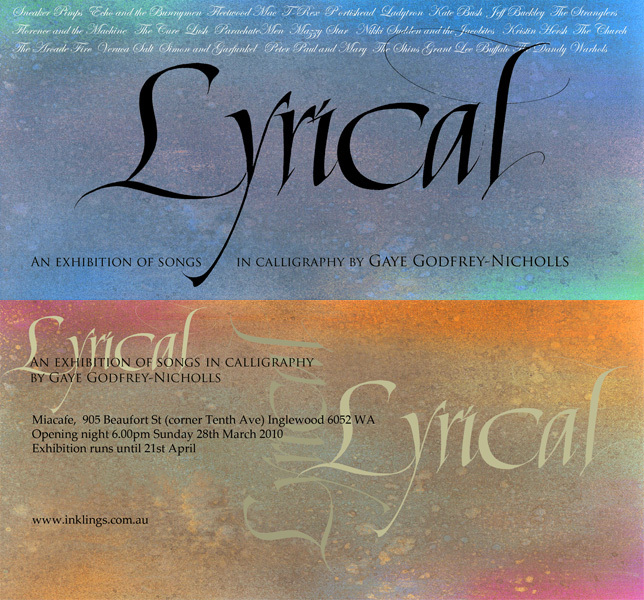 I am Gaye Godfrey-Nicholls, a qualified, professional calligrapher with over 20 years of experience working in Perth, Western Australia. My business, Inklings Calligraphy, provides unique hand lettering for a wide range of applications. Displayed here is my gallery of calligraphic artworks as well as a range of work that I do as a professional calligrapher. All of my artwork is hand lettered using a variety of instruments and media. Much of my business work involves wedding stationery, a variety of commissions, as well as certificates. I design and produce original works both as unique one-offs and for reproduction. I have an Associate Diploma of Arts, majoring in Calligraphy and Fine Lettering (one of the few tertiary full-time calligraphy courses ever offered anywhere!) and have freelanced as a calligrapher with my own business since 1986. I teach calligraphy classes to people of all ages from primary school to retirees. Contact me for prices and my availability - I require notice on large jobs in order to schedule them in. Finished work can be collected personally, posted or you may arrange for it to be couriered. 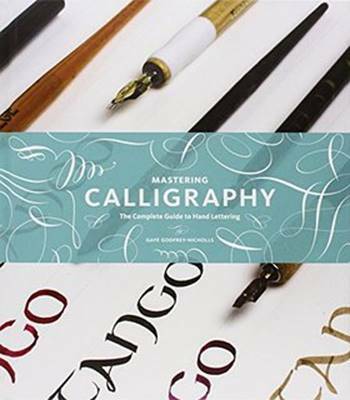 and Mastering Calligraphy (US) is available from selected bookstores and online. Don’t be fooled by the title and cover differences – it is exactly the same book. 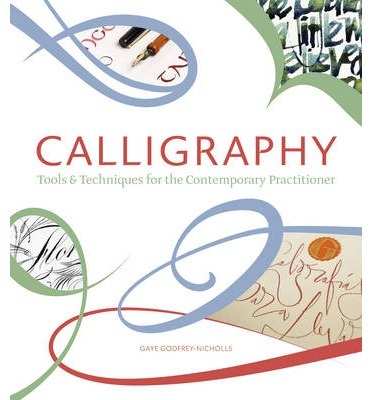 Released in 2013, it is intended as a practical guide and workbook for the beginner as well as the intermediate and beyond calligrapher. It contains exemplars, profiles of international calligraphers and galleries of work for inspiration as well as step by step projects. Order it from The Book Depository or Amazon. I have just completed a video showing the italic hand in action. It is also viewable on YouTube. Please click below to view. It was done quickly in one take without much planning, with the intention to display it here and at the Calligraphers' Guild of WA Inc exhibition Caligrafia. The Exhibition will open at 6pm Sunday 19th October at Miacafe, Beaufort St, Inglewood and run until 16th November. The music is "The Arrival and the Reunion" followed by "Saltarello" from the album Aion by the always inspirational Dead Can Dance, a most appropriate musical accompaniment for calligraphy! My most recent work has been uploaded to a new page for your perusal. 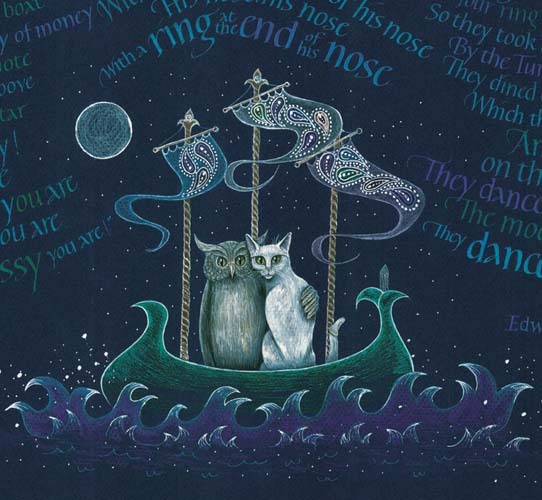 I have had some interesting commissions of late and highlights have included doing a family tree for Juliet Marillier's latest book and getting work published in Somerset Studio. 25th February 2008 - New Website! After almost two years of having a placeholder image as a website, I finally have Inklings Calligraphy (v2.0) on the web. Hooray! Many thanks to my wonderful husband Craig, for his unflinching (some may say obsessed!) work on the site. This really is his baby, and he learnt to use the Dreamweaver software from scratch in order to set it up. It has taken many months of compiling, scanning, learning web coding, photoshopping out marks, flares and splatters, fixing bugs and glitches, changing categories and adding new ones. It's been like Sisyphus always rolling his stone up the hill - just when we think we've finished, I find more stuff to include! He spent so many hours getting my scans web ready that he is now an honorary calligrapher! Muchos gracias mi amor. Grateful thanks to Scot Nicholls and Glen Spoors for their feedback on earlier versions of the site (and there have been many). Also thanks to Gary Storm for his helpful comments getting internet explorer working and Lokesh Danar for the elegant LightBox2 script that displays the gallery images. Thanks to Wendy Tweedie for photographing my larger pieces. Please contact me if you have any problems with or comments about the website - feedback is welcome! ©2008 All images and artwork remains copyright of Gaye Godfrey-Nicholls. Original text copyright remains with authors.